Convolutional neural network (CNN) is one of the most widely used neural network models for image pattern recognition. The latest CNN models have better performance than humans, but they require a lot of computational complexity and huge data storage space. Due to its large input datasets and weight parameters for convolution operations, a high-speed and low-power(energy) ASIC design to accelerate CNN operations becomes very important. 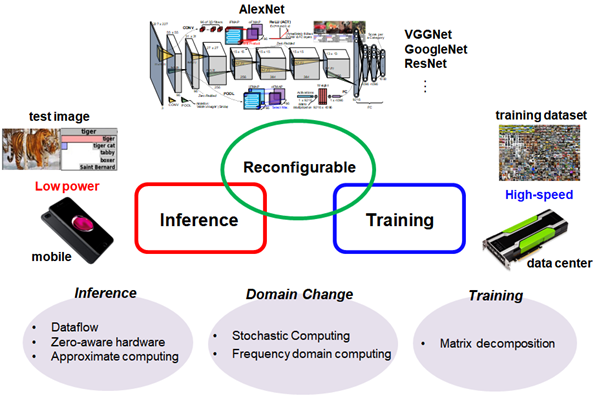 Our research focus is a CNN accelerator design for energy efficient inference/training of various CNN models by applying the following techniques.